A new study has shown that Indonesia lost about 60,000 sq km of virgin forest - an area close to the size of Ireland - over a period of 12 years. The rate of deforestation has increased so much that Indonesia has for the first time surpassed Brazil in the rate of its clearance of tropical forests. Scientists monitored the growth of deforested land in Indonesia between 2000 and 2012 using satellites. 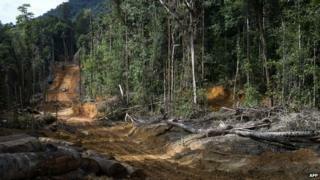 They say the land was cleared to make way for palm oil plantations and other farms. By 2012, the loss of primary forest every year in Indonesia was estimated to be higher than that in Brazil, said scientists. In that year, Indonesia lost 8,400 sq km of forest compared to Brazil which lost 4,600 sq km. The researchers, from the University of Maryland, said that deforestation had led to an increase in greenhouse gas emissions and a loss of biodiversity. Indonesia has 10% of the world's plants and 12% of the world's mammals. It is known for its diverse wildlife which includes orangutans and Sumatran tigers. A government moratorium on deforestation was signed in 2011 and was intended to slow down the pace of deforestation. But environmental activists say corrupt politicians are quick to sell off huge swathes of rainforests for profit, and they point to the need for more monitoring and sanctions to stop the rate at which Indonesia is losing its forests, says the BBC's Karishma Vaswani. Massive forest fires in Indonesia to clear land last year caused a heavy smog to blanket neighbouring Malaysia and Singapore, triggering health concerns in those countries. Norway has pledged a billion dollars to Indonesia if it can prove it is serious about stopping deforestation. Agencies report that Norway has paid almost $50 million to Indonesia to help set up new institutions to reduce deforestation. But Indonesia will only start to get large amounts of money if deforestation is slowed down.